Premium-quality 5mm thick tempered glass guarantees the durability of the window and adds overall strength to the chassis. Swing Doors on either side allows users to demonstrate their DIY spirit and enjoy the ultimate internal component visibility. Take on easy to install building with a fully modular design and easy removal of swing door for full access. The View 71 TG Edition enables users to freely build their system from the ground up with modular panels, racks, brackets, and pre-design mounting arrays. No more unreachable screw corners or gaps to enjoy even more space for your precious parts during installation or maintenance. 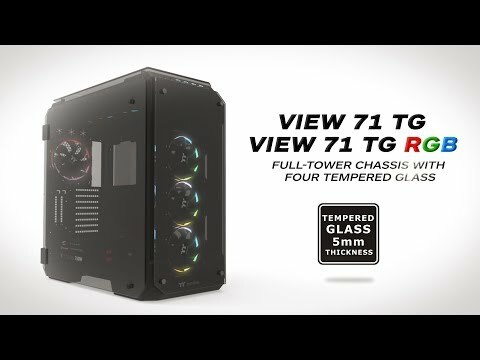 The View 71 TG Edition allows users to build a complete high-end system that supports motherboards up to standard E-ATX with high-wattage PSU up to 220mm length. With extended graphic card support (up to 410mm), the case simultaneously protects the hardware and increases the CPU’s overclocking potential for users looking to get the most out of their hardware. Modular HDD cage design offers more flexibility for custom cooling loops to take advantage of high-end, maximum capacity, cooling allotment without the reduction of GPU length limitations when incorporating enthusiast grade liquid cooling systems. Specially designed for dual GPU placement options, the View 71 TG Edition has the support for vertical graphic card layout with dual PCI-E slots design. Integrated riser GPU support bracket not only prevents the graphic card from sagging, but also helps to reduce the weight on the motherboard PCI-E slots. Supports a wide range of GPU solutions with ultra-excellent quality. Features like, extreme high-speed cable with highly-routable design, EMI shielding with conducting polymer are crafted for meeting the most demanding system. Available in 300mm, 600mm and 1000mm length. *PCI-e riser cable is optional, not included, & available separately. *VGA width limitation when using with GPU bracket: 68mm (3.4 expansion slot reference). 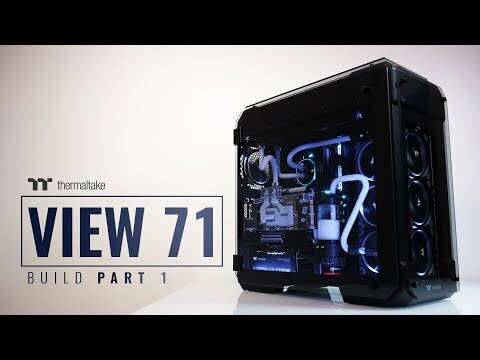 The View 71 TG Edition features its roomy installation space for advanced AIO/DIY liquid cooling components. The case is natively supported for all types of AIO liquid cooling solutions. The case has the capability to house up to triple 420mm DIY liquid cooling radiator fitment and up to 360mm AIO liquid coolers. Most importantly, the case design is optimized for providing users a quick way to access the drain valve without having to turn around the entire PC when evacuating coolant from the loop. *Recommended to use Thermaltake’s all-in-one liquid cooler when applying vertical AIO radiator mounting. With wide top-to-bottom side ventilation grills, the View 71 TG Edition maximizes airflow with two built-in 140mm Riing Blue fans. Including options for up to three 120mm or two 140mm front fans, combined with two bottom mount 120mm fan locations for maximum fan space selection. Dissipate heat properly with one rear fan and three sectional top mounts to manage proper air flow in and out. 140mm high-static pressure fans with a patented blue LED rings. 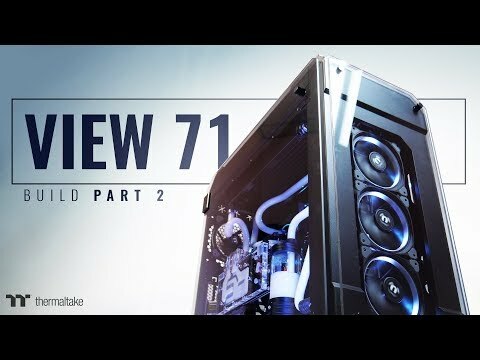 Thermaltake View 71 Full Tower Computer Chassis, w/ 4x Tempered Glass Windows, EATX/ATX/mATX/mITX, 2x140mm Blue LED Fans is rated 4.5 out of 5 by 2. Rated 5 out of 5 by vbad1 from thermaltake view71 tg most recent build , with either asus Rog Rampage 5 Edition 10 , i7 6900k , Corsair , Thermaltake and Ek bits and of course Mayhems X1 UV Green with the Msi Sea Hawk 1080ti Ek as the icing on the cake , was a bit of a challenge to fit the 2x Thermaltake 420 Rads but otherwise problem free installation. 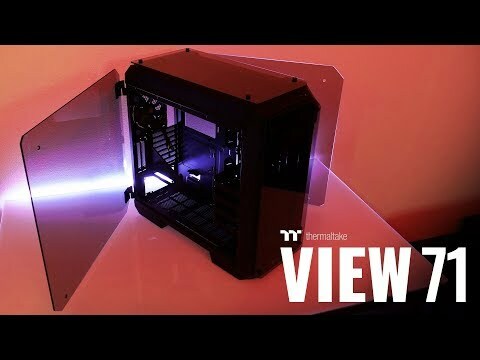 Rated 4 out of 5 by colm98 from THERMALTAKE VIEW 71 TG The View 71 from Thermaltake offers unrivaled performance among glass-paneled cases, for users with the strength to lift it, the money to pay for it, and the patience to deal with its minor manufacturing flaws.